This is not just another code camp. Our week-long Software Design and Development Clinic is designed to start transforming experienced developers into software engineers capable of managing complex software systems. A solid software engineering foundation is essential for creating quality software. Decades of experience has taught us many things and shaped how we approach software development. We believe this is so powerful that it must be shared with our fellow software developers and engineers if the industry is going to advance the practice of software design and development. Our approach to the Software Design and Development Clinic is not based on lectures alone. 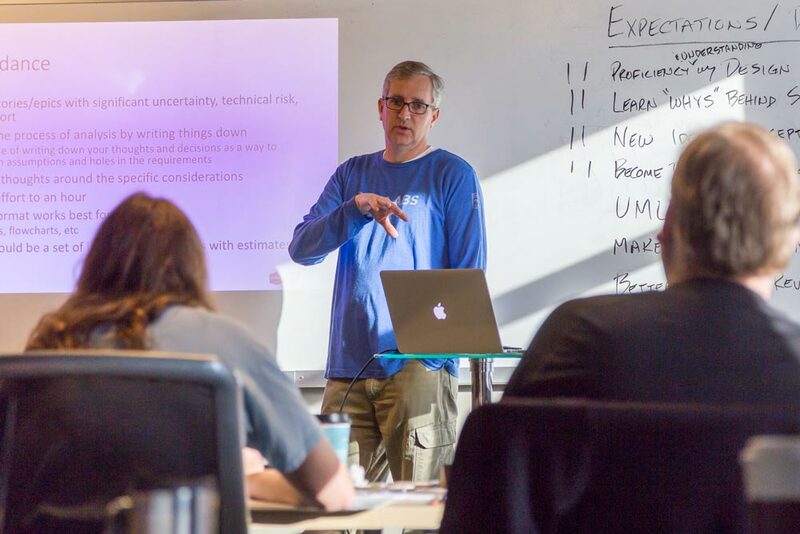 At least 2/3 of the class is spent with real‑world code and in-depth exercises to illustrate how best practices and proven methodologies can make developers more productive, feel more effective, and produce well-architected software. Make students aware of the software crisis, and how we compare to other industries. Cover the classic concepts of software design. Show why good design is necessary for flexible, scaleable, and maintainable systems. Introduce dependency injection, why it is good, how to implement it, and how to use it. Provide students with tools to decompose an ecommerce solution using volatility-based decomposition. Equip students with a basic set of tools for diagramming a system. Illustrate the value in tasking things out. Students should understand the importance of thinking things through before jumping into code. Provide a good understanding of how to write automated tests, and motivate the students to do so. Provide a framework for decomposing a system into contracts and data contracts. Empower students to conduct better code reviews, and write code that is easier to review. The hands-on portions include continued development of the Ecommerce software project, which involves adding features to the solution with a focus on interface and contract design, implementing complex workflows, and developing automated unit and integration tests. Introduce what it takes to improve the quality of a legacy system while adding business value. Provide examples of how refactors have been done successfully. Introduce students to async patterns, especially the use of queues within mature architectures. Show students how to set up a new solution in Visual Studio to maximize productivity. Give students experience with dependency injection frameworks such as Unity. 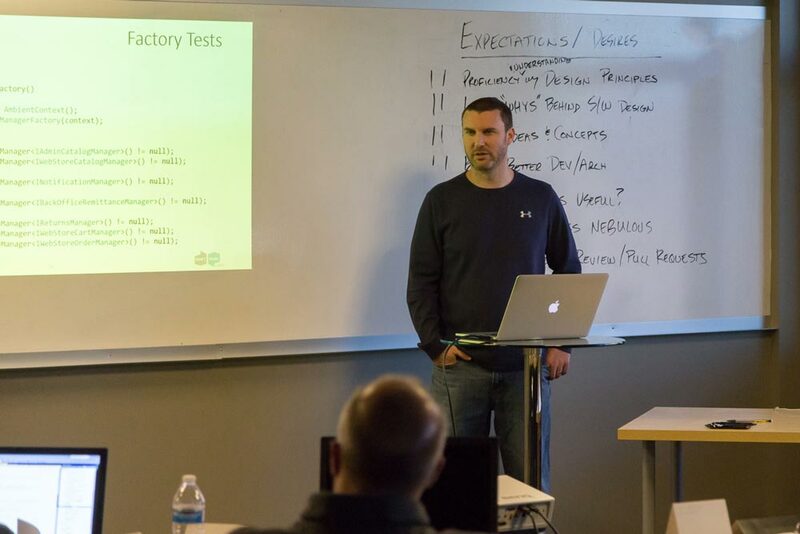 Students will learn to use testing frameworks to simplify automated testing. Let’s have fun writing software! Effective team communicators who excel at sharing what they learn, interact well with other team members, and can both accept and provide constructive feedback. Productive developers who are effective at completing their work in a timely manner. Pattern followers who work well at adapting existing code but may not fully possess the “big picture” understanding needed to identify when and how to apply design principles. 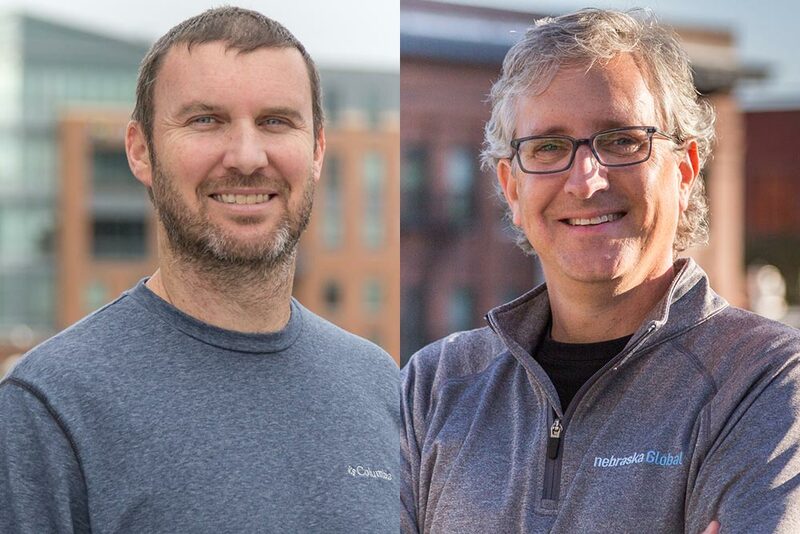 The Software Design and Development Clinic is led by Don’t Panic Labs CEO Doug Durham and Software Architect Chad Michel. Together they have over 50 years of software development and architecture experience. Since classes are limited to 12 students, there are many opportunities for discussions with the instructors.